So, I looked up a few quiet books to get some ideas, but a lot of what I found just wasn’t age appropriate for a 1 year old. So I just decided to do a quiet name book. It’s pretty straightforward. Just letters of the child’s name, one to a page. It’s never too early to know how to spell your own name. 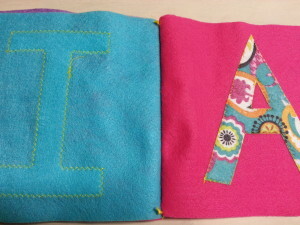 The first thing you want to do is decide what colors you want to make your book pages and letters. Since I am making this for my niece, I went with pink, purple, turquoise, and different patterned felt for the letters. It’s really up to you. You can make it simple using only two colors, or get as wild and crazy as you like. Just pair up your fabric to see what looks best. Now it’s time to cut out your letters. I used my niece’s first name. If you are using stencils, then it’s pretty straight forward as to how to use them I would think. If you are free handing your letters, just be sure to use a straight edge and mark your letters off so you won’t have any wavy edges. It will really show up next to your background. 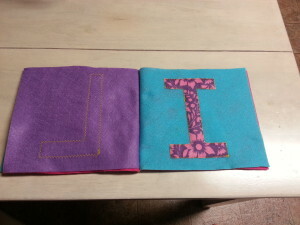 For the next step, you can either use fabric glue to glue your letters onto the backgrounds or you can sew around the letters. 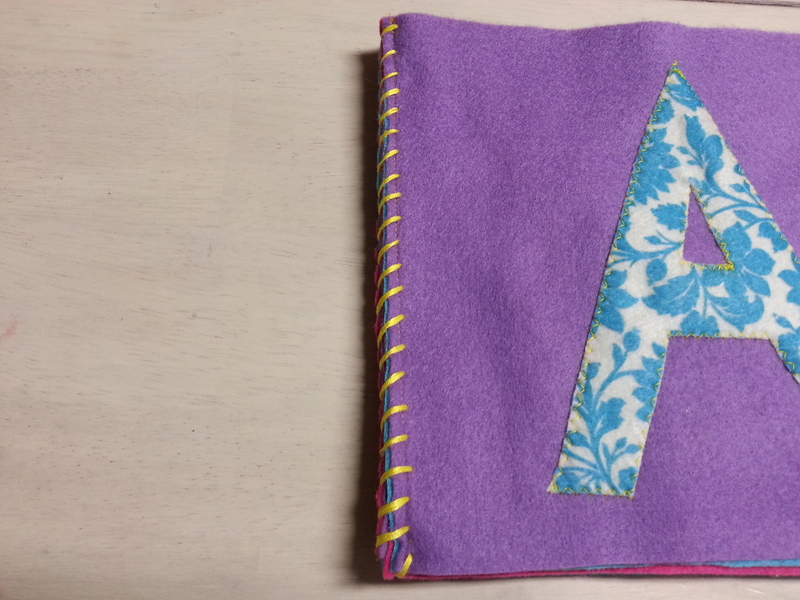 I sewed my letters to keep them in place and to keep little hands from peeling the letters off. This is just my personal preference. 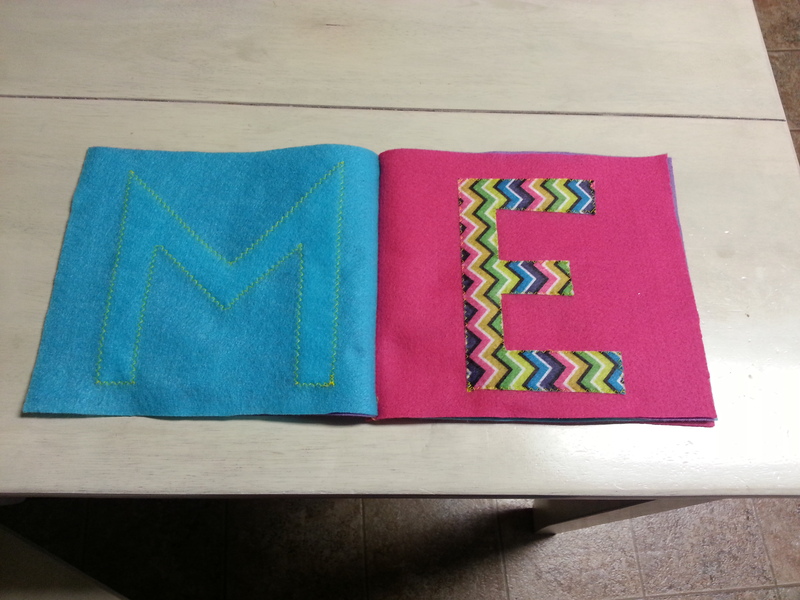 If you are using fabric glue, apply with a paint brush or sponge. If the bottle has a nozzle, you may want to go back after squirting the glue and spread the glue as close the the edge of the letter as possible. This will help to keep anyone from getting their fingers under the letter to pull it off. Do this for every letter. 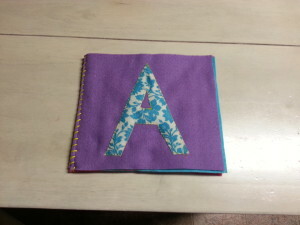 You are basically appliquéing the letters onto the backgrounds, but without using backing. 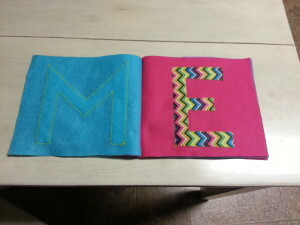 Anyway, once you go all the way around the outside of the letters don’t forget the inside if there is one. This step can get a little tricky if your book is more then 2-3 pages. In order to bind the pages together, you can either sew them or glue them. 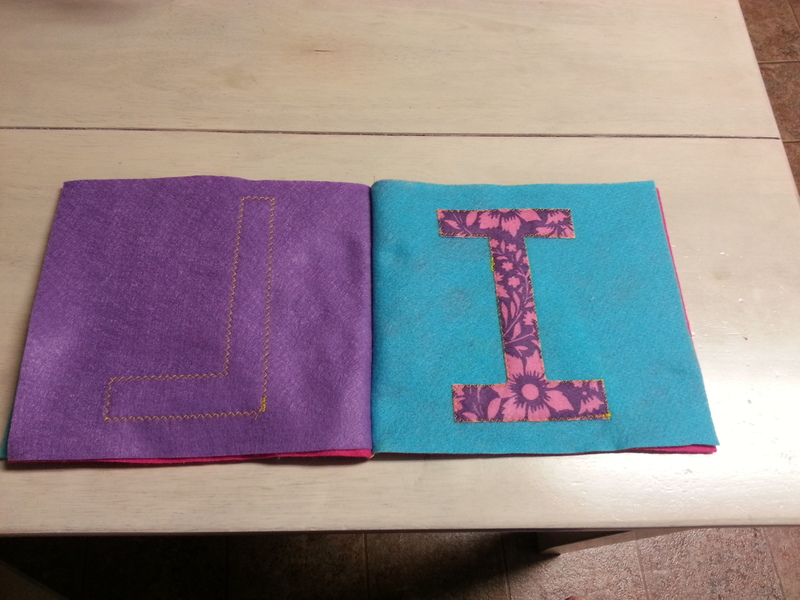 I chose to sew, just to make sure things wouldn’t be pulled apart. If you are gluing your pages together, just make sure the glue goes all the way to the edge. You only want about one strip of glue down the side. Too much glue will get messy. Once you have all your pages glued together, set a heavy object such as a book or sturdy box along the glued spine to keep the pages pressed together while the glue is drying. If you are sewing your pages together, you will only be able to sew through 2-3 pages at a time. I pieced two pages together and sewed them before sewing the whole book together. I just found it easier to keep the book together while sewing the spine. After machine sewing your pages, put all of the pages together and pin into place. Now take your embroidery floss and thread it through the needle. You are going to do a whip stitch down the spine. Basically, pull the needle through one side only. You do this over and over all the way down the spine. Tie it off when finished. I tied my ends on the inside of the last page so the knots would be hidden. Now you have created your very own quiet name book! There are several tutorials out there for more elaborate edges and different ideas of what to put in a quiet book, so get out there and find what you like! I hope this tutorial helped you out as far as the basics go. Let me know what you think or if you have questions, comments, or concerns. I’m always open to new and better ways of doing things if anyone has suggestions! I hope you all have a great day and stay tuned for more DIY projects in the future!